Pumpkin & Squash Toast presents ingredients one doesn’t normally find together: pumpkin, acorn squash, ricotta, cranberries, pecans, and sweet, salty & peppery seasonings. It’s part dessert, part main course, but completely delicious. The pumpkin has long been recognized as the show-off of the squash family, both for its size and color, but they’re surprisingly bland on their own and owe much of their popularity to Halloween, and of course, that Thanksgiving’s pumpkin pie. 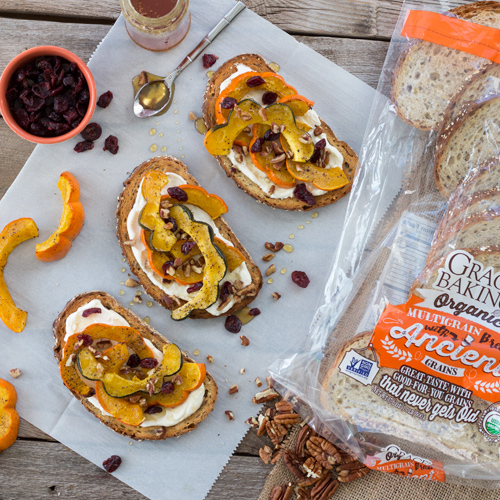 But we like to think that it’s our Organic Multigrain with Ancient Grains that marks the renaissance of the pumpkin. If autumn had a taste it would be equal parts pumpkin, squash, and our bread. Preheat oven to 375ºF. Line a baking sheet with foil. Brush both sides of pumpkin and acorn squash slices with oil and place on the baking sheet. Sprinkle with sea salt and black pepper and roast in oven for 15 minutes. Flip squash and pumpkin slices over and return pan to oven. Cook until the skin is soft and the pumpkin and squash begin to caramelize (approximately 15 more minutes). Toast bread and spread Ricotta on each slice. Top with roasted pumpkin and squash slices, dried cranberries, pecans and a drizzle of honey.